Seven-time Grammy winner and Pollstar’s three-time top female country touring artist, Carrie Underwood, will launch a new arena tour in Spring 2019. 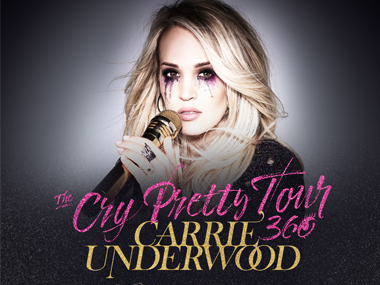 Sponsored by CALIA, The Cry Pretty Tour 360 will make a stop at Golden 1 Center on May 14, 2019 joined by special guests Maddie & Tae and Runaway June. Underwood made the announcement this morning in a personal video to her fans. Her highly anticipated new album Cry Pretty is out September 14. Pre-sale tickets will be available beginning August 16 at 10 a.m. local time and general tickets will be available to the public beginning August 17 at 10 a.m. local time at Golden1Center.com.